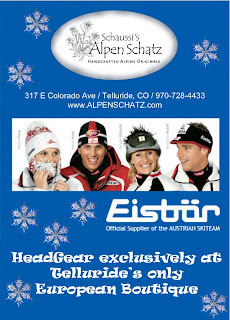 Alpen Schatz is now one of the ONLY stores in the United States to carry Eisbär Ski Hats of Austria. Eisbär is THE trendiest hat to have whilst skiing in Switzerland, Austria, France and Italy and is also the official hat of the Austrian Ski Team! Alpen Schatz is excited to be one of the first to offer them to the US market! Call our Boutique in Telluride, Colorado to order! 970-728-4433. BE ONE OF THE FIRST IN THE USA TO BE HIP WITH Eisbär!